Vicki knew that her 17 year-old air conditioning system was on borrowed time, so when she found our giveaway on Facebook, she decided to enter for her chance to win. After surviving cancer, helping her Mom in her senior years and two kids in college, the family's finances were of course limited for this upgrade. She knew that their A/C would need replaced soon, but like many, wasn't saving up specifically for this project, so she wasn't sure where the funds would come from. 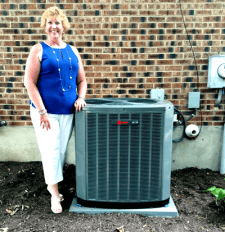 We were so excited to call Vicki with the good news; although she and her husband were hesitant to believe that this was, in fact, a free air conditioner, with FREE installation, we put their concerns to rest when we installed their brand new Trane A/C yesterday! Vicki had great things to say about our installation team, Bobby and Obie, who worked very hard to get the new air conditioning system set up and ready for the rest of the summer heat. Congratulations again! We hope that you stay very comfortable for many years to come!